In light of a recent study showing that teens become riskier drivers as they get older, parents may want to know which cars are the safest for teens. Encouraging safe driving habits is essential, but having a vehicle that comes loaded with advanced safety features and driver-assistance technologies can also help prevent young drivers from getting into an accident. To help parents in their search for the safest set of wheels, U.S. News & World Report released its list of the Best New Cars for Teens. The following eight 2017 models were chosen by the publisher for their outstanding combination of reliability, crash protection, accident avoidance features, and critic recommendations. All of the vehicles named above come with forward collision warning and automatic braking, which can slow or stop the car if a crash is seemingly imminent. The above models also have lane departure warning, which can help make sure your child stays in their own lane. The vehicles chosen have features that can help to ease parents’ worries while their child is behind the wheel, says Jamie Page Deaton, managing editor of U.S. News Best Cars. "We selected cars with top-of-the-line safety features, including accident prevention and crash protection technologies, as well as features that allow parents to track their new drivers,” Deaton said. Instead of wondering if your teen is driving safely, several vehicles come equipped with features that enable you to see how your teen is driving in real-time. The Hyundai Elantra and Kia Sorento both have apps that send parents an alert when a car goes over a set speed, outside a set geographic area, or is driven after a certain time of day. Other vehicles bring you up to speed on your child’s driving habits with a report card. 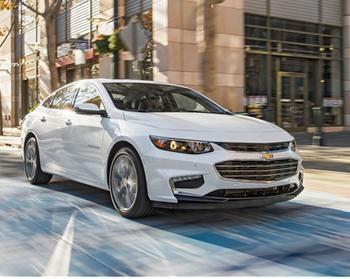 The Chevrolet Malibu and Chevrolet Cruze have a Teen Driver system that gives parents a report card on their teen's driving behavior.